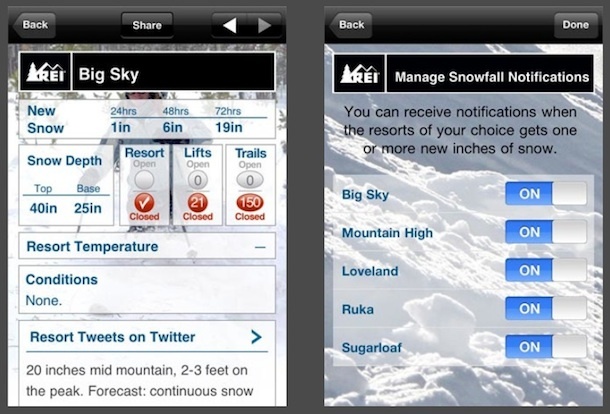 Want to check mountain conditions right from your iPhone? The appropriately titled Snow and Ski Report app by REI offers an easy way to check on snow conditions and ski resorts from anywhere, and it’s free. Snow and Ski Report gives you snow information for the past 72 hours, total snow depth, the number of trails and lifts that are open, access to the mountains webcams, a five day forecast, and it also follows a resorts Twitter feed so you can get up to date information directly from the operator. You can easily add multiple resorts to follow and have push notifications tell you when any of them get new snow. The app is a free download available through the iTunes App Store, click here to grab it. If your winter free time revolves around snow conditions and what’s going on at your local mountain, this app is for you. For the price of free, you just can’t beat it.